This medication must be given only by injection into a vein (intravenously-IV) by a trained healthcare professional. Deaths have occurred with medications similar to vinorelbine that were injected into the spine. Vinorelbine can lower your blood cell counts (bone marrow suppression) and lower your ability to fight an infection. Your doctor will follow your blood counts closely. Tell your doctor right away if you develop any signs of an infection such as fever, chills, or persistent sore throat. If this medication accidentally leaks out of your vein into surrounding tissue, the skin and/or muscle may be severely damaged. Tell your doctor right away if you have pain, redness, swelling, or discoloration at the injection site. Who should not take Navelbine Vial? Vinorelbine is used to treat various types of cancer. It is a chemotherapy drug that works by slowing or stopping cancer cell growth. Vinorelbine is given by injection only into a vein by a healthcare professional. It is usually given over 6-10 minutes, once a week, or as directed by your doctor. The dosage is based on your medical condition, response to therapy, and body size. If this medication comes into contact with your skin, wash your skin right away and completely with soap and water. If vinorelbine gets into your eyes, flush them right away and completely with water, and contact the doctor. Nausea, vomiting, fatigue, constipation, diarrhea, dizziness, muscle aches, joint pain, or irritation at the injection site may occur. If any of these effects persist or worsen, notify your doctor or pharmacist promptly. To prevent constipation, eat a diet adequate in fiber and drink plenty of water. Your doctor may also prescribe a laxative (such as a stool softener) to help prevent constipation. Tell your doctor right away if you have any serious side effects, including: numbness/tingling/pain in the hands or feet, decreased reflexes, mouth sores, easy bruising/bleeding, weakness, new or increased trouble breathing, cough, severe constipation, stomach/abdominal pain, blood in the urine, mental/mood changes. Get medical help right away if this rare but very serious side effect occurs: chest pain. A very serious allergic reaction to this drug is unlikely, but get medical help right away if it occurs. Symptoms of a serious allergic reaction may include: rash, itching/swelling (especially of the face/tongue/throat), severe dizziness, trouble breathing. List Navelbine Vial side effects by likelihood and severity. Before using vinorelbine, tell your doctor or pharmacist if you are allergic to it; or if you have any other allergies. This product may contain inactive ingredients, which can cause allergic reactions or other problems. Talk to your pharmacist for more details. This medication should not be used if you have certain medical conditions. Before using this medicine, consult your doctor or pharmacist if you have: decreased bone marrow function/blood cell disorders (e.g., anemia, leukopenia, thrombocytopenia). Before using this medication, tell your doctor or pharmacist your medical history, especially of: liver disease, numbness/tingling of the hands or feet, blockage of the stomach/intestines (e.g., obstruction, paralytic ileus), heart disease. Vinorelbine can sometimes cause a serious skin reaction that looks likes a severe sunburn when given after radiation treatment (radiation recall). The reaction usually develops on the skin area previously treated with radiation within days to months after vinorelbine treatment. Throat problems can also be part of radiation recall with vinorelbine. Tell your doctor right away if you develop skin redness/tenderness/swelling/peeling/blisters or painful/difficult swallowing. Your doctor may prescribe medication to treat your symptoms. If you develop a skin reaction, avoid prolonged sun exposure, tanning booths and sunlamps. Use a sunscreen and wear protective clothing when outdoors. Use caution with sharp objects like safety razors or nail cutters, and avoid activities such as contact sports to lower the chance of getting cut, bruised or injured. This drug may damage sperm and decrease fertility in men. Men with female partners of childbearing age should use reliable forms of birth control (such as condoms) during treatment and for 3 months after treatment with this medication. This drug is not recommended for use during pregnancy. It may cause harm to an unborn baby. Women of childbearing age should use reliable form(s) of birth control during treatment with this drug and for some time afterwards. Consult your doctor for more details. It is not known if this drug passes into breast milk. Because of the potential risk to the infant, breast-feeding while using this drug is not recommended. Consult your doctor before breast-feeding. What should I know regarding pregnancy, nursing and administering Navelbine Vial to children or the elderly? A product that may interact with this drug is: mitomycin. Other medications can affect the removal of vinorelbine from your body, which may affect how vinorelbine works. Examples include azole antifungals (such as itraconazole), macrolide antibiotics (such as erythromycin), rifamycins (such as rifabutin), St. John's wort, drugs used to treat seizures (such as carbamazepine), among others. 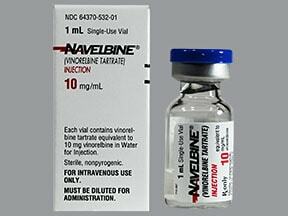 Does Navelbine Vial interact with other medications? Laboratory and/or medical tests (e.g., complete blood counts, liver function tests) should be performed periodically to monitor your progress or check for side effects. Consult your doctor for more details. Not applicable. This medication is given in a clinic and will not be stored at home.Information last revised November 2016. Copyright(c) 2016 First Databank, Inc.
Are you taking Navelbine Vial? 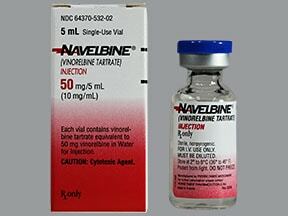 Are you considering switching to Navelbine Vial? How long have you been taking Navelbine Vial?